Sidewalk artist Peregrine Church knows that a rainy day can make a person feel pretty blue, which is why he decided to create artwork that can only appear on a rainy day. 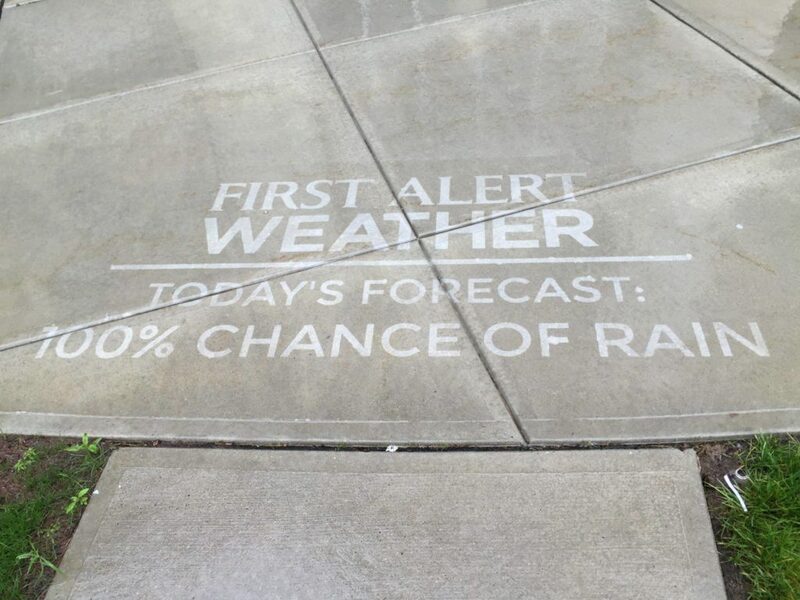 “Rainworks are pieces of street art that only appear when they’re wet and they’re messages or images designed to make people’s rainy day a little bit brighter,” Church said in a YouTube video. Church lives in Seattle, which is of course know for its rainy weather, making the entire city the perfect canvas for his craft. Some of his messages are very witty. Others are just plain beautiful. At 20 feet in diameter, this circular “drop-scotch” that takes you through the water cycle is the LARGEST and most complex rainwork ever created, and should make your rainy day more interesting! The first hopscotch, near Alaska Junction in West Seattle! But all of them are meant to bring a little joy into the life of everyday citizens, so that even on a rainy day, they still find themselves walking on the sunny side of the street.